A new approach to nuclear disarmament, nonproliferation, and the prevention of nuclear terrorism that focuses on controlling the production and stockpiling of nuclear materials. Achieving nuclear disarmament, stopping nuclear proliferation, and preventing nuclear terrorism are among the most critical challenges facing the world today. Unmaking the Bomb proposes a new approach to reaching these long-held goals. 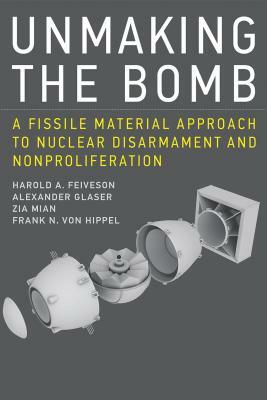 Rather than considering them as separate issues, the authors--physicists and experts on nuclear security--argue that all three of these goals can be understood and realized together if we focus on the production, stockpiling, and disposal of plutonium and highly enriched uranium--the fissile materials that are the key ingredients used to make nuclear weapons. The authors describe the history, production, national stockpiles, and current military and civilian uses of plutonium and highly enriched uranium, and propose policies aimed at reducing and eventually eliminating these fissile materials worldwide. These include an end to the production of highly enriched uranium and plutonium for weapons, an end to their use as reactor fuels, and the verified elimination of all national stockpiles. Harold A. Feiveson is Senior Research Policy Scientist in the Program on Global Security at the Woodrow Wilson School of Public and International Affairs at Princeton University. Alexander Glaser is Assistant Professor in the Woodrow Wilson School and in the Department of Mechanical and Aerospace Engineering at Princeton University. Zia Mian is Research Scientist and Director of the Project on Peace and Security in South Asia at the Woodrow Wilson School. Frank N. von Hippel is Senior Research Physicist and Professor of Public and International Affairs Emeritus in at the Woodrow Wilson School. Von Hippel is a former Assistant Director for National Security in the White House Office of Science and Technology.